Box Text: Mama says you're now big enough to prepare delicious dishes from 10 different nations. Then you'll put your skills to the test and cook off against a friend. Ready to show Mama what you're made of? 06-04-2015 listontj Box Text Mama says you're now big enough to prepare delicious dishes from 10 different nations. Then you'll put your skills to the test and cook off against a friend. Ready to show Mama what you're made of? 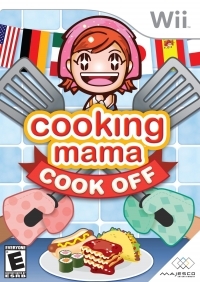 This is a list of VGCollect users who have Cooking Mama: Cook Off in their Collection. This is a list of VGCollect users who have Cooking Mama: Cook Off in their Sell List. This is a list of VGCollect users who have Cooking Mama: Cook Off in their Wish List.